We’re usually fond of Asus’ flagship motherboards, but while they’re usually dripping with features to make any enthusiast drool, very few people can afford them. Imagine, then, that both of those factors were multiplied several times over and combined in a wallet-crushing feature-fest of a motherboard. 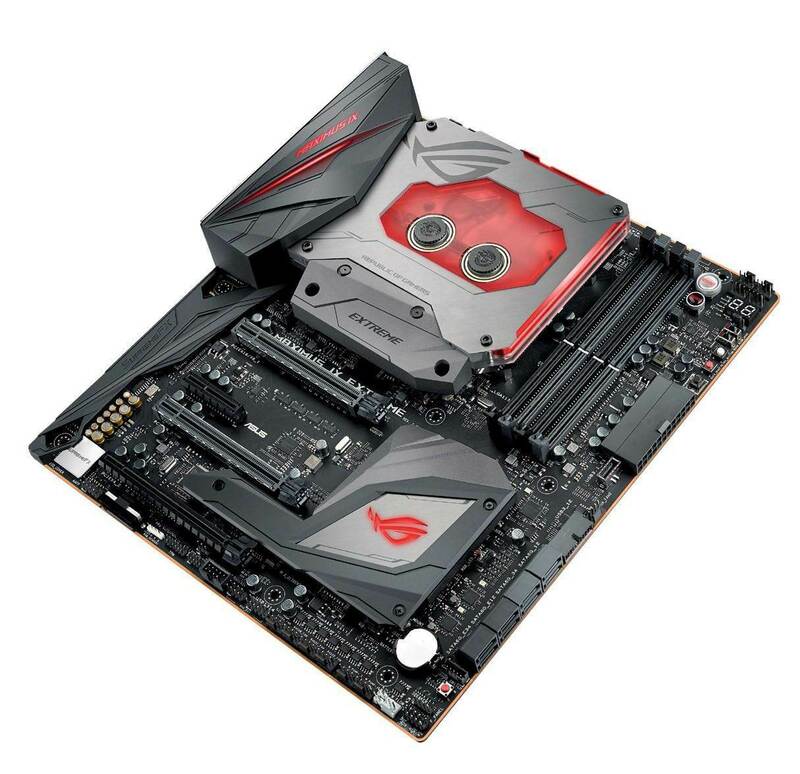 That’s essentially what Asus has done with the Maximus IX Extreme, its most feature-laden and expensive mainstream Z270 motherboard. It’s so expensive, in fact, that it outstrips the mighty X99- based ROG Rampage V Edition 10. Why on earth would you spend over £500 on a mainstream motherboard when a board such as the Rog Strix Z270-F Gaming costs less? The answer comes down to features. The most obvious one is a huge waterblock, which was co-developed with Bitspower, a well-known waterblock and fitting manufacturer, and it looks amazing. It cools the CPU and surrounding VRMs, but unlike previous waterblocks we’ve seen that come with motherboards, this one needs to be actively water-cooled to work, so you’ll need to have a water-cooling system ready for it. The whole contraption also has a single G1/4 inlet and outlet, sporting leak sensors that can be configured to switch off your PC should the worst happen. Of course, these sensors only detect leaks at this point, not anywhere else. The block has integrated RGB lighting too, as well as its own flow meter with a spinning wheel, plus temperature sensors, with two cables protruding out the top, ready to connect to a nearby USB header and RGB LED header. In addition, there’s also a bolton heatsink for the top M.2 port, which connects to the waterblock, so even your M.2 SSD can be water-cooled. Amazingly, this feature worked even better than MSI’s M.2 Shield heatsink, knocking over 20°C off the peak temperature of our Samsung 960 Evo. The block isn’t ready to use out of the box – you need to remove it to install your CPU, as well as several thermal pads that sit on top of the CPU power circuitry. Installation is straightforward, but the block does make the Maximus IX Extreme extremely heavy. There’s also a large PCH heatsink and plastic shroud that covers the second M.2 port, which has its own RGB LED. The final bit of RGB lighting comes in the I/O panel shroud, with the Maximus IX logo lighting up, but thankfully the lighting generally isn’t too glaring. 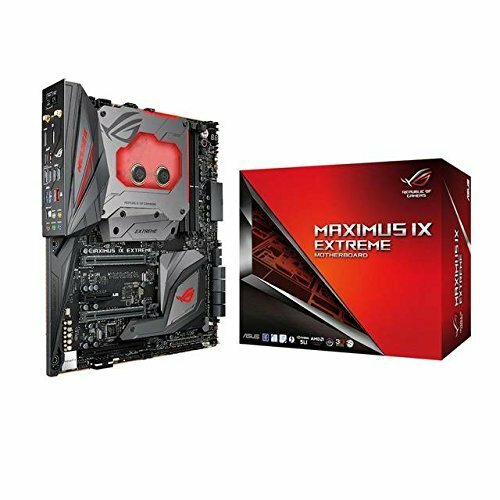 The Maximus IX Extreme also has the most fan headers we’ve ever seen on a motherboard – 12 on the PCB and more provided by an included fan hub. They’re not all for case fans though; some are earmarked for radiator fans and two can even power 3-pin pumps, such as the Phobya DC12-220 we used for testing, with the ability to control its speed too. There are separate flow rate sensors and temperature probes as well. Combined with Asus’ excellent EFI and software fan control, the Maximus IX Extreme can act as the control centre for a monster PC. 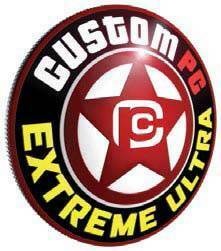 There’s a plethora of extreme overclocking tools, including an LN2 mode and slow mode, plus there’s a dual BIOS switch and extra power connectors for the CPU and graphics cards. Meanwhile, the rear I/O panel has a built-in shield, which looks extremely neat and offers a clear-CMOS button and USB BIOS Flashback. Asus includes its USB 3.1 header too for future-proofing, but there are also USB 3 and USB 2 headers for current and older devices. It’s the first board we’ve seen with an angled ATX connector for neat cable routing too – a feature we’d definitely like to see more in the future. Of course, there’s the usual eight SATA 6Gbps ports, plus six USB 3 ports on the rear panel and USB 3.1 Type-A and Type-C ports. There’s also on-board 802.11ac Wi-Fi and, being a ROG board, there’s ROG SupremeFX S1220 audio – a tweaked version of the standard Realtek ALC1220 codec, which has performed very well on other boards such as the Maximus IX Formula. 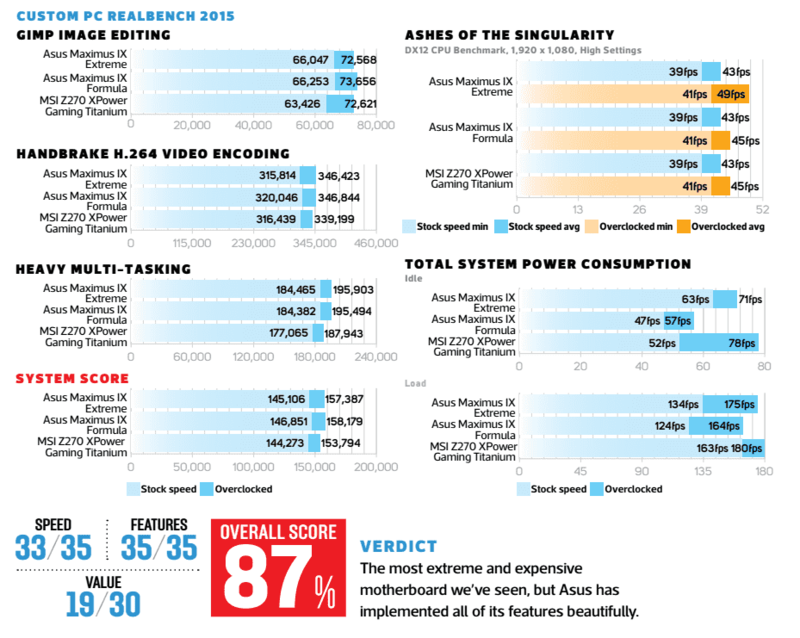 The system score of 145,106 at stock speed wasn’t the fastest on test, with the ROG Strix Z270F Gaming and Maximus IX Formula managing slightly quicker results, and the same was true in Ashes of the Singularity. With all the paraphernalia on the PCB, it wasn’t surprising to see the Maximus IX Extreme draw the most power at idle either, although only by around 10W. As usual, our Core i7-7700K was limited by temperature. Despite being water-cooled, we could only get it to the usual 5GHz, which required a vcore of 1.34V, which isn’t particularly low either. Even raising the vcore to 1.45V didn’t yield a stable 5.1GHz overclock. This overclock did raise the system score rise to 157,387, but it’s a shame the waterblock didn’t yield much of an improvement here. Audio performance was excellent, though, with a dynamic range of 115dBA and noise level of -109dBA, making it the best-performing Realtek-based audio we’ve seen. There was no problem pushing our M.2 SSD to its limits either, and the waterblock seemed to make a small difference too, with the 1,835MB/sec write speed being nearly 40MB/sec faster than any other motherboard we’ve seen. 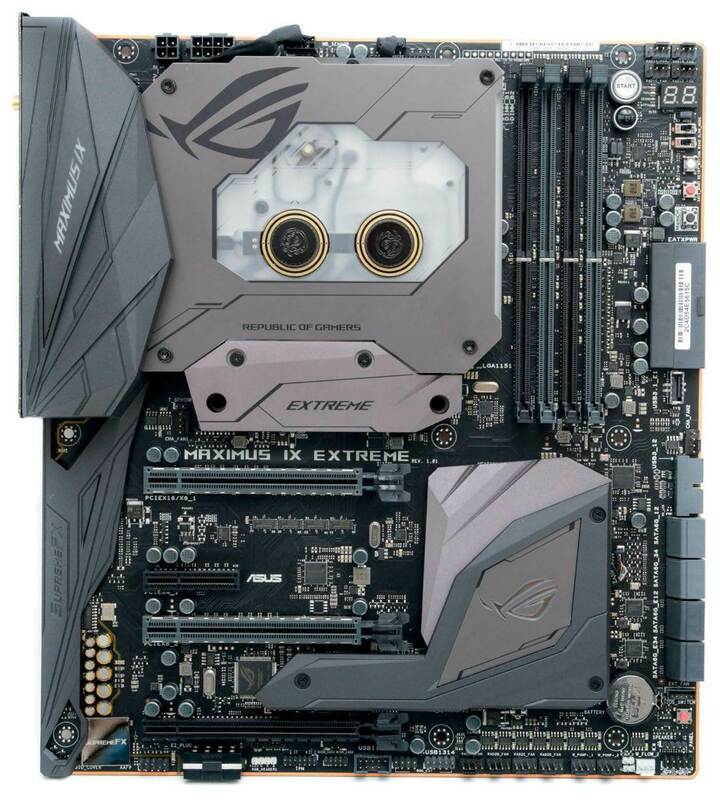 The abundance of features, including the gorgeous waterblock, makes the Maximus IX Extreme a board we’d love to own, and it goes a long way to justifying its price tag. After all, far more basic waterblocks retail for upwards of £150 alone. As an all-in-one package, it’s an exceptional motherboard with few flaws, although it still demands a hefty premium, and you’re unlikely to gain any extra overclocking headroom, even if your CPU is running cooler. The most extreme and expensive motherboard we’ve seen, but Asus has implemented all of its features beautifully. You can’t argue with the huge feature set though – this board has it all. If you want the best motherboard possible, have no need for more than four CPU cores and have plenty of cash to spend, this board is for you.